As a point of interest, if you want to ride mountain passes, big ones, then alongside Chamonix we can’t think of a much better base to have than Briancon. This is the reason why we’ve stayed here so often over the years. 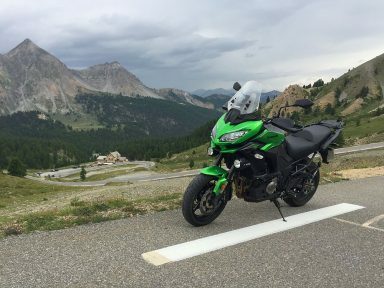 There are literally dozens of fantastic roads and passes to choose from, many giants and icons of the Alps, and they all link up beautifully with Briancon. And incidentally at 1,326m it’s the highest city in France. We had another late start this morning, our first but by no means last mistake today. There was no sign of Phil first thing so Kyle and Taj headed off to breakfast without him, which incidentally is very good at Hotel de la Chaussee. There’s always plenty of coffee, a range of cereals, and ample supply of eggs, hams, cheeses, breads, and the like. Outside the weather was distinctly overcast so while Kyle waited for his eggs to boil he checked the weather app on his phone. The forecast for today wasn’t good. It was going to remain overcast until early afternoon when rain was due. The rain would start light but become heavier culminating in thunder and lightning sometime around 5pm. At this point it was barely 9.30am. Expecting our planned 220 mile ride to take somewhere in the region of 7 hours it seemed reasonable to think that if we got our skates on, we could still do the ride and be back before the worst of the weather arrived. 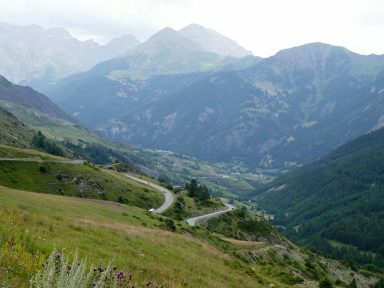 Originally the idea of a ride out to Col Agnel or Col de Mont Cenis, or possibly Col de la Bonette had been mooted for today. These are all great rides. 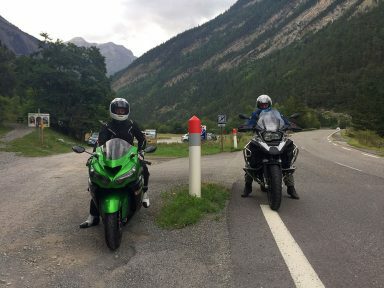 In terms of distance though they can be fairly long and we were mindful that on leaving Briancon tomorrow a long 900 mile ride home lay ahead of us. So we settled on the 220 mile route that included the Izoard, Vars, and Allos – all practically on our doorstep. On catching up with Phil, Kyle explained the weather situation and suggested a 10am start. Phil concurred and the plan was agreed. What was good about the proposed route was should the weather take a turn for the worse sooner than predicted, there were a couple of bail out points where we could cut the ride short and return to the hotel early. So suited and booted, and by appearances at least, looking like we were prepared for wet weather, we met up at the garage. 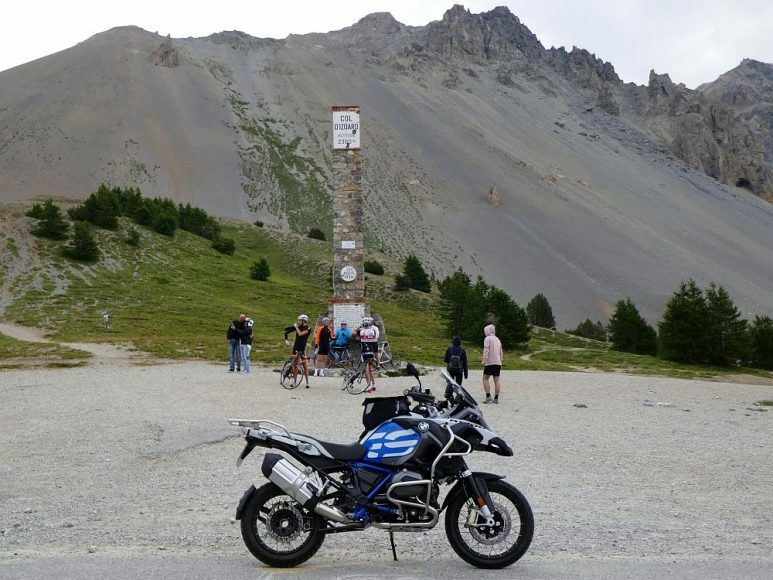 It’s 12 miles from our hotel to the monument at the top of the Col d’Izoard so the first pass of the day really was on our doorstep. The Izoard is a popular climb for cyclists and this morning was no exception, maybe even more so with the forecast being for rain later in the day. So we took our time on the way up, enjoying the ride just as we had done going up Semnoz a couple of days ago. 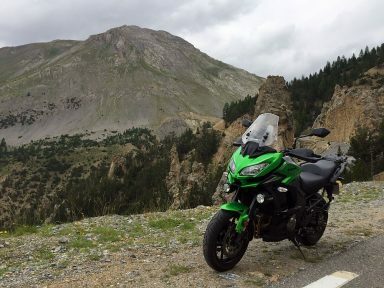 The first half of the ride up was a relatively straight run, all the way up to Cervieres which is the village that lies at the foot of the Izoard. From this point on though the road began to twist and turn and became a lot of fun. 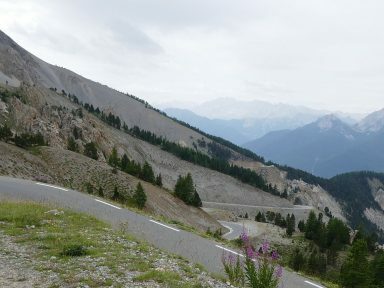 The road surface was very good, wide too, and while some of the hairpins and switchbacks were tight there was always plenty of room to manoeuvre on them. Arriving at the top we made a brief stop and took in the breathtaking panorama. Taking a closer look at the monument we gleaned that it’s a memorial and the date on it, 12th August 1934, is the day the road was officially completed by the French military. A lot of Alpine roads were built by the French military in the 30s to guard against an invasion by either Italian or German forces. Only a couple of miles down the other side and we came to Col de la Platriere, technically a col but could just as easily be mistaken for a lookout point, and then a further 4 or so miles down we arrived at Arvieux. This marks the foot of the Izoard in much the same way Cervieres did on the way up, and from this point it was a straight 3 mile run down to the D902 at the bottom of the valley. At the junction that marked the end of the Izoard we turned right to join the D902. 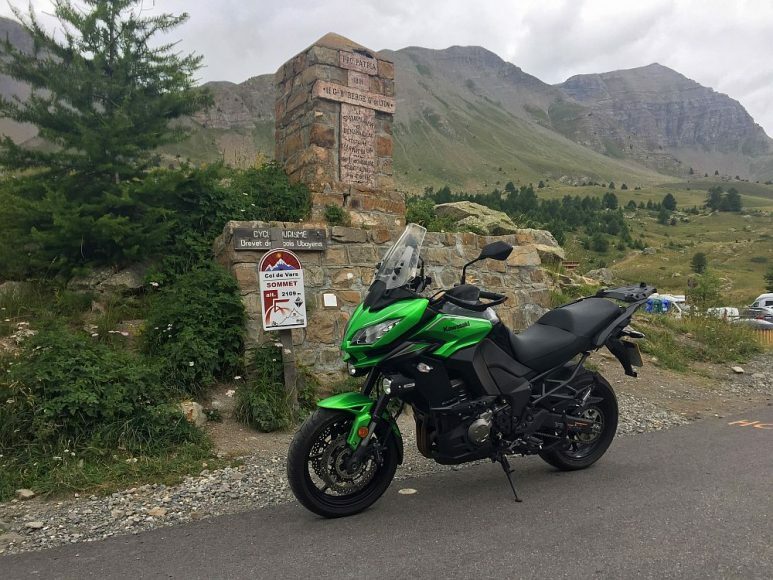 This road takes you all the way to the Col de Vars and we really enjoyed it. 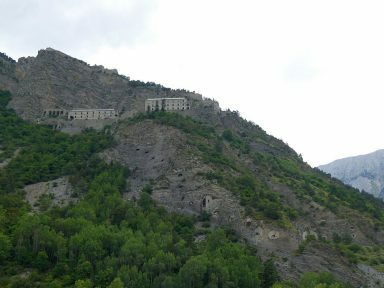 Particularly the first section where it runs down the valley alongside the Guil river, all the way to the Gorges du Guil. As you’d expect the scenery here was good although the road did begin to narrow as we entered the gorge. There were also a series of tunnels to negotiate with the final one, just outside Guillestre, being controlled by traffic lights. When we got to Guillestre it was 11.30am and the weather was no worse than when we’d left Briancon. While it remained overcast, with rain threatening, there was no real evidence of it yet. 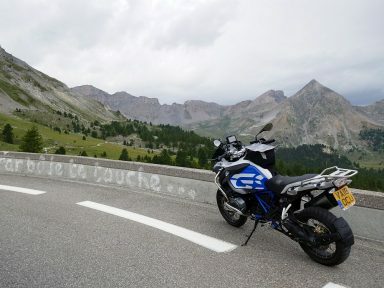 We were now at our first bail out point – it’s an easy 40 minute run up the N94 to Briancon from here – but didn’t see the need to bail just yet. So we continued on our way. On the outskirts of Guillestre there were two sets of roundabouts. We took the second exit at each of them and headed up the Vars. We hadn’t ridden a mile up the Vars when we felt the first spots of rain. But we’re a stubborn bunch – or over optimistic, and we carried on regardless, completely dismissing our opportunity to turn around and cut the ride short. In all fairness by the time we reached the top of the Vars the rain had stopped, with the worst of it falling at the bottom of the pass, and lasting for no more than 10 minutes. After a coffee stop at the top we made our way down the other side to Saint-Paul-sur-Ubaye, effectively the bottom of the pass, and then Les Gleizolles where the D902 met the D900. We really enjoyed the descent and in fact we all remembered saying much the same 5 years ago when we last came down it. At the junction we turned right and joined the D900, another good stretch of road that took us down the Ubaye Valley through Jausiers and all the way to Barcelonnette. There was however a brief interlude a couple of miles after we joined the D900. 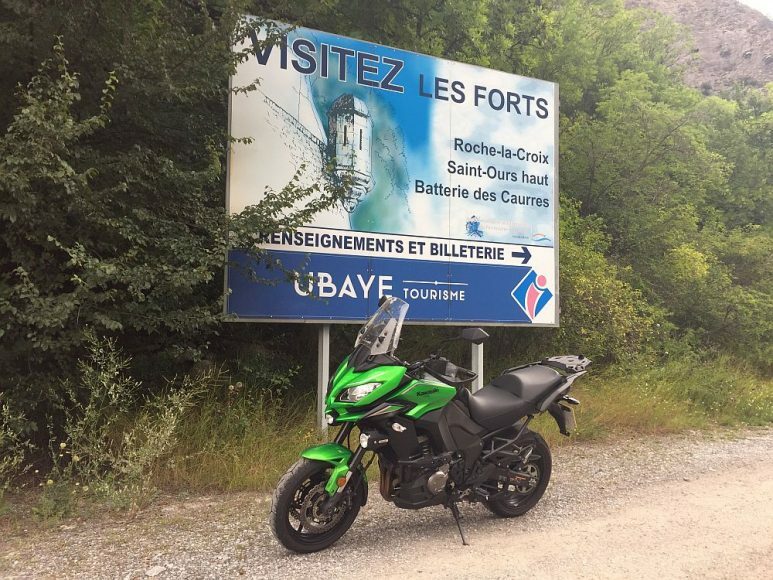 The Fort de Tournoux is a fortification complex that was built between 1843 and the early 20th century to defend France against invasion from Italy and Savoy. It last saw action during World War II but over subsequent years it was gradually decommissioned before eventually being sold by the military to the local government. Ever since then it has been undergoing renovations. It was almost 1pm when we got to Barcelonnette. This was our other bail out point. From here we could either retrace our steps back over the Vars and then pick up the N94 from Guillestre to Briancon. 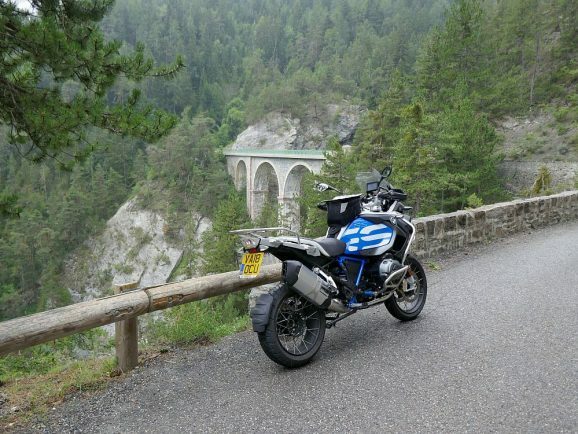 Or we could take the D954 towards Lac de Serre-Poncon and then pick up the N94 to Embrun and Briancon. 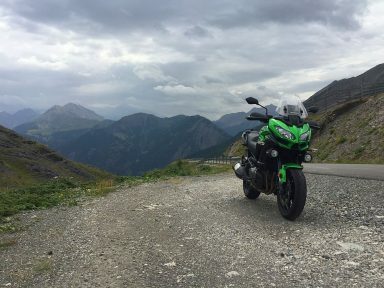 There isn’t much in either of these routes to be honest, both around 1hr 45 mins, but that’s an irrelevance anyway because we carried on to the Col d’Allos regardless. 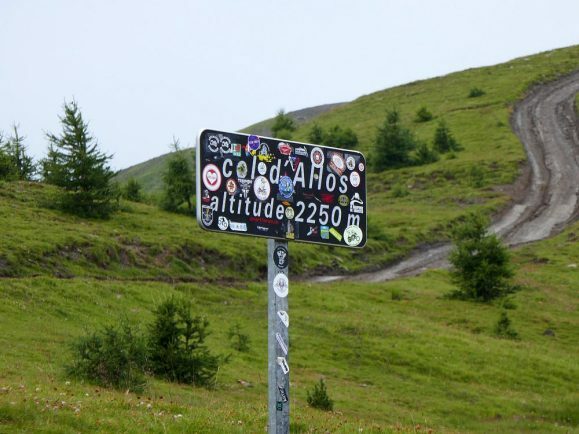 That was our second mistake of the day because just like it had on the Vars, a mile or so in to the Allos and the heavens opened, except this time it wasn’t going to relent. And to boot we were riding up the northern ramp, not the easiest of rides in the dry, let alone the wet. It’s mainly single track with a lot of blind bends and so for the next 10 miles, as the intensity of the rain increased, we crawled ever slower up to the top in the vain hope that things might be better on the other side. They weren’t, they were significantly worse. While the southern side of the Allos was preferable to the side we’d just come up, descending it in torrential rain was no fun. By the time we reached the ski resort half way down it we’d negotiated a dozen tight hairpins and were more than ready for a break. At the first cafe we came across we pulled over, ordered coffees all round, and collected ourselves. In a nutshell our situation was like this: the rain was getting harder, it had begun thundering and lightning, and we were now as close to Briancon as we were far from it. It was almost 2pm by now and from here, regardless of which route we took, and in these conditions, we faced a 4 hour ride. As we saw things retracing our steps made no sense – and would have been downright dangerous anyway. Our only viable option was to see our original plan through to its conclusion. 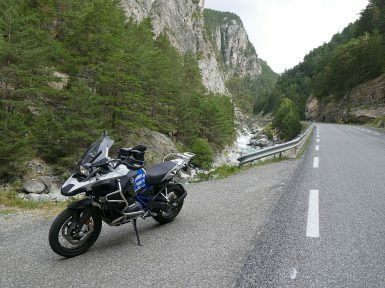 That meant riding to Digne-les-Bains, picking up the D900 and eventually D954 to Savines-le-Lac, then hoofing it up the N94 into Briancon. What transpired over the next 4 hours and 136 miles was quite frankly a war of attrition. Every mile we knocked off was fought for and the constant battle we faced against the elements was as much mental as it was physical. Not one single mile was easy and it’s hard to put into words just how treacherous conditions became. It wasn’t until the following day that we got the lowdown on the storm we’d ridden through. It had caused widespread flooding across much of southern France resulting in the evacuation of more than 1,600 people, most of them campers. In the space of only a few hours more than 3 inches of rain had fallen causing landslides and washing away roads. As far as we were concerned though we hadn’t fared too badly, and our bikes had stood up to the conditions even better. Which is more than could be said for our textiles, gloves and boots.